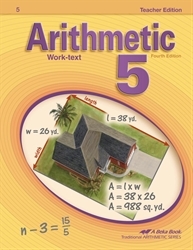 Confidently present your arithmetic lesson with prompts and teaching tips in the Arithmetic 5 Teacher Edition. This teaching resource includes a copy of the student book with answers for each problem; teaching notes; prompts to reference what is on the chalkboard and other visuals; a Story Problem Solution Key with problems worked out, and homework assignments. This invaluable tool allows you to follow along with your students, check their work, and present foundational concepts in interesting ways to help students remember and apply them.